Last night’s dinner was made up of old standards with a twist. 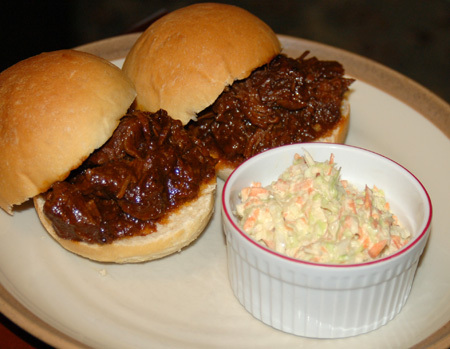 I’ve been making barbecue beef sandwiches from boneless beef ribs for years. I always use the same recipe and have had a draft post containing just that in the queue for at least a year and a half, but somehow I have never gotten around to writing up text to go with it. 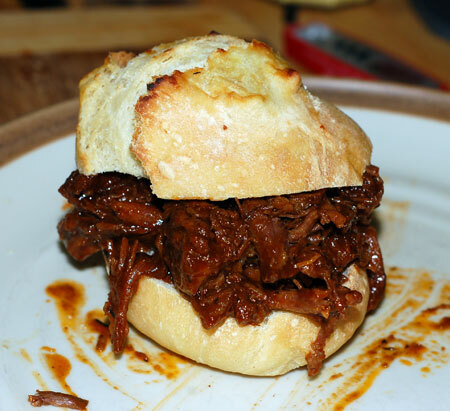 It is a pretty basic recipe with seared cubes of meat simmered slowly in a ketchup-based homemade barbecue sauce, and I always serve the meat in homemade sandwich rolls. This time around, I abandoned the usual sauce and used up the last few cups of peach butter barbecue sauce that I had on hand, thinned with a bit of chicken stock. As for the buns, I made a variant of the family favorite that used a buttermilk substitute—equal parts milk and plain yogurt—in place of the water and powdered milk; then I applied the method outlined in my house sourdough recipe, adding an autolyse up front, a shorter kneading period and two folds. The rolls were just as pillowy soft as ever, with less active work on my part and a stand mixer whose bowl didn’t screw itself on too tightly for me to remove (which happens every time I knead dough the more traditional way, for 10 minutes straight with the dough hook). To go with the barbecue beef sandwiches, there was an absolutely gigantic head of cabbage from Pitchfork and Crow crying out to be made into coleslaw, but one problem: no mayonnaise, and no appealing recipes that didn’t call for it. 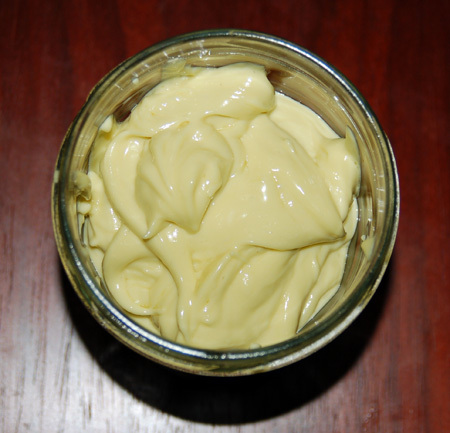 I’ve had no luck in the past with making mayonnaise from scratch: whisking by hand, food processor and mini-chopper all gave me the same soupy, though emulsified, result (as shown above). This has been a particular source of irritation for me since one of my main characters, when I played World of Warcraft (emphasis on the past tense), was called Aioli. This time I chose a lacto-fermented mayonnaise recipe from Nourishing Traditions via GNOWFGLINS, and made it in the blender. The main difference here is just the addition of a little whey to kick-start the fermentation. I poured in the oil as slowly as I possibly could, ignoring the little bits of soupy mayo that were whizzing out of the pour-hole in the blender lid until the oil was gone and the sound coming from the machine was oddly less splashy. A tentative peek confirmed my hopes: I actually achieved mayonnaise-textured mayonnaise this time! I think the recipe made about a cup and a half of mayo; half went into a small jar and fermented on the counter for a few hours (I think it was about 4 hours, then I had to refrigerate it because we were going to bed) and the rest stayed in the blender to mix with the rest of the ingredients for that coleslaw dressing. The finished coleslaw was tasty, but not perfect. I haven’t come across quite the right blend for my taste yet, but it helped that I used prepared whole-grain mustard rather than dry (which packs more punch heat-wise than I want in my coleslaw) and omitted the celery salt, whose flavor has just ruined my previous attempts at coleslaw. I think this recipe could be excellent with a few slight tweaks, and has the benefit of being probiotic to boot! In a dutch oven, heat oil over medium high and sear meat on all sides. Drain off fat. Add remaining ingredients. Cover and simmer over medium low heat for 1 1/2 to 2 hours, until tender enough to shred. Crank up the heat and boil until sauce is reduced. Ribs may also be covered and baked at 350 degrees for 1 1/2 to 2 hours, or simmered all day in a crock pot. If you have a food processor, by all means use the shredding disc to deal with the cabbage, carrots and onion. Otherwise, you can use a mandoline, box grater, or even just a knife and a steady hand. Combine the shredded cabbage, carrots and onion in a large bowl. 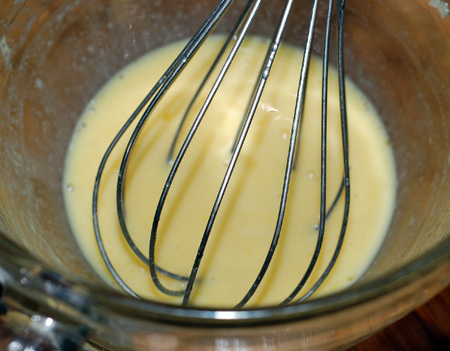 Whisk together the mayonnaise, sour cream, sugar, vinegar, mustard, salt or celery salt, and pepper in a medium bowl, and then add to the cabbage mixture. Mix well to combine and taste for seasoning; add more salt, pepper, or sugar if desired. Mmm! This sounds like the perfect meal combo!